Covering an area of 18 square kilometers, the lake is a popular summer resort and a major travel destination in Srinagar. 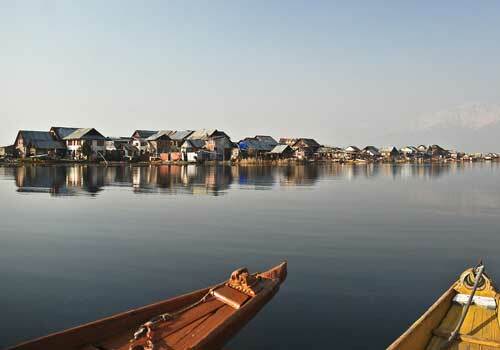 The Dal Lake is blessed with an amazing beauty and surrounding which makes it more attractive. People visit the Dal Lake to get a better view of the hidden beauty which is worth exploring and also get involved in activities such as boating, swimming, canoeing and snow skiing. 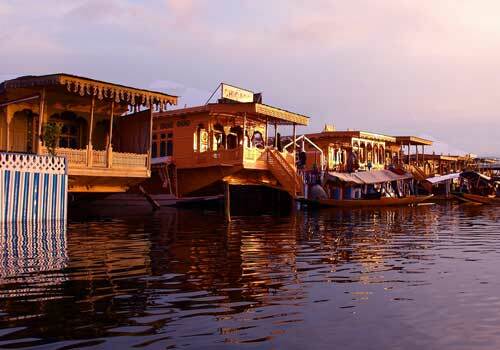 One of the major things to do in Dal Lake is to take a trip on the house boats which are indeed the hallmark of Dal Lake. The amazing house boats that are available at Dal Lake helps you cruise through the lake and explore the beauty and marvelous surrounding landscape. Due to the amazing facilities and architecture, these houseboats are often referred to as “floating palaces” and is built as per the customs of the British. The houseboats which are usually built up of local cedar wood almost looks like a luxurious hotel inside with a wide range of facilities and royal luxuries. The well furnished rooms, the spacious verandas and the terrace offers a spectactular ride along the Dal Lake. Due to its large size, the house boats really find it difficult to reach the shores to pick and drop the travelers. For this purpose a small paddled taxi boat, which is often known as “Shikara” is used to ferry travelers to and the shore. Shikara is a traditional Kashmiri boat which is used for ferrying as well as for the transportation of goods from one part of the lake to another. A Shikara can generally accommodate six people and is not far behind when it comes to comfort and almost reminds us of a Mughal style. 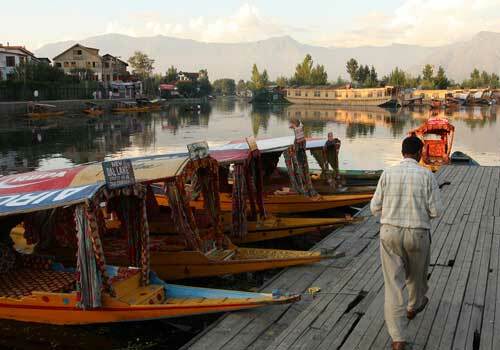 A trip to Srinagar is not complete without a trip to Dal Lake and a trip to the Dal Lake is not complete without a houseboat ride along the lake. So if you are visiting Dal Lake then you should surely take a ride on the amazing houseboats and failing to do this will be a huge regret for the rest of your life. A houseboat trip on the Dal Lake is a perfect experience for people of all ages and during the peak tourism season; you will really find a large number of travelers queuing up for a ride. You will indeed have to pay money to take a ride on the house boats or Shikaras, but the money is very less when compared with the amazing experience you come up with. The perfect time to visit Dal Lake is during the months of July to August when the climate is amazing and you can also get a view of the fully blossomed floating gardens. During the winter season the Dal Lake becomes fully frozen and you will not be able to take boat ride or any other travel activities. So better plan your trip to Dal Lake during the months of July to August. Dal Lake is easily accessible from Srinagar by road and you will be able to get a lot of transportation facilities such as taxis, state buses, auto rickshaws etc. If you are coming on your own vehicle then things will be more easy for you. This entry was posted in Srinagar and tagged dal lake, dal lake boat ride, dal lake srinagar, house boat dal lake, shikara dal lake. Bookmark the permalink.